With all the craziness going on at the Melrose Project — the delays, the lawsuit, the discussion regarding who may or may not be putting a garden on its roof — there is indeed a stunning amount of great news emanating from the fabulously refurbished building between Pike and Pine. That news includes the recent debut of butcher Russ Flint’s Rain Shadow Meats, cheesemonger Sheri LaVigne’s the Calf and Kid and grower Katherine Anderson’s tiny flower-shop Marigold and Mint. It also extends to the second coming of Fremont’s Homegrown sustainable-sandwich shop, slated to open in June. But the biggest news out of Capitol Hill this week — for those of us who obsess over our foodstuffs — was the opening of Matt Dillon’s reincarnated Sitka & Spruce. When I heard-tell from a trusted source that Dillon’s 12-seat butcher-block table (an extension of his open kitchen and wood-fired hearth) was certain to become the hottest ticket in town, what can I say? I just couldn’t wait. So I went. And what I found was a food-fetishist’s wonderland of warmth and good cheer, and an intensely romantic space that struck me as a spiritual melding of the original Sitka & Spruce on Eastlake and its Georgetown successor, The Corson Building. Happy customers, communing at the communal table at Sitka & Spruce — to my thinking, the best seats in the house. As luck would have it, I showed up without a reservation and cadged a solo seat smack in the middle of the communal table. There I was welcomed by the parties sitting to my left and my right, where I made new friends — including the adorable Aunt Marilyn, adopted “aunt” to half the town. Turns out she’s a blood-relation of Matt’s favorite forager, Jeremy Faber and (who knew?) an old neighbor of my friend and former Eastlake-landlady Lynda Gilman. Aunt Marilyn, who’s lived in New Yawk and L.A. and is a regular at Eastlake’s Nettletown (“Try it, you’ll love it!”), site of the original Sitka & Spruce, closed since December. What do you want to bet she’s got a direct line to some great foraged and found edibles. Elsewhere in the angled room marked by high ceilings, whitewashed brick and exposed rafters — and partially open onto the Melrose marketplace — couples shared plates at a counter facing the street, while others sat at an intimate distance at a handful of small tables. 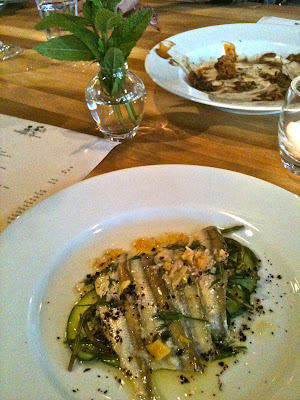 Puget Sound smelt with cucumbers, preserved lemon and tiny sea beans (foreground). A decimated platter of Rain Shadow’s chorizo with boletus edulus (that’s “pardon my Latin” for porcini mushrooms) in the rear. My new friend Ruth, dining with her in-laws from Spokane, insisted I order the lenrimmad-style halibut with creme fraiche, honey and fennel she’d eaten before I arrived. When I insisted she eat some more when I got my plateful, I didn’t have to ask twice. Warm roasted vegetables including baby carrots, tiny turnips with their crisped greens still attached, sweet leeks — or were those ramps? — with anchovy-brown butter and breadcrumbs. Local roots, indeed. This hearth-baked baby chicken with yogurt and harissa was beyond succulent and tasted like (you guessed it) chicken: the carefully fed and sustainably raised kind. I’m not a big dessert eater, but I was blown away by this olive oil-gelato with olive oil-cake and strawberries. Aunt Marilyn’s screen-writer friend Nick, visiting from L.A., couldn’t believe he was eating olive oil in and on his sweets. But for those of us who knew and loved the first Sitka & Spruce, where we’d been introduced to the idea years ago, that joy came as no surprise. 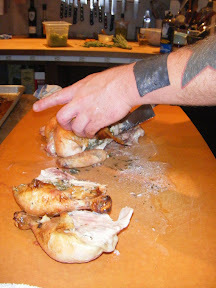 Matt Dillon, whose T-shirt logo matches his favorite tattoo (of Washington State), carving my chicken at Sitka & Spruce (in photo, left). At right he’s carving chicken for a roomful of guests in his kitchen at The Corson Building, in 2008.